This has been an upsetting and bizarre story about a 6 year-old boy named Falcon. I've never before live-photo-blogged a developing story and don't have plans to do it again. 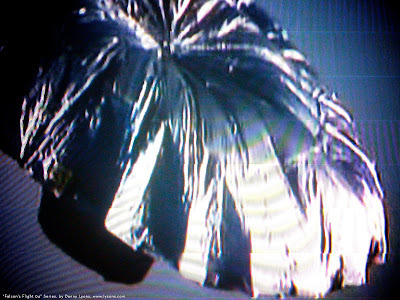 Viewers were led to believe that Falcon was inside the "basket," which was presumed to be the small, bottom portion of the balloon. Once the balloon landed, a freakish moment ensued when authorities and police lassoed, slashed, stomped and stabbed the helium-life out of the mylar balloon. Currently, CNN is reporting that the "basket" had actually fallen off the balloon long before the television coverage began. Now they are showing a photograph on CNN that shows something, presumably the basket, far below the mylar balloon. It seems to be a photograph, or a still-shot from a film camera, showing the basket detaching and falling from the balloon. If this is in fact the case, this doesn't bode well for young Falcon. We'll continue to follow this ever-changing, difficult story and remain hopeful that Falcon will be found alive and well.